Broccoli is one vegetable that people love or hate. I, for one, don’t like broccoli until I find ways of cooking it to make it more appealing to my taste. 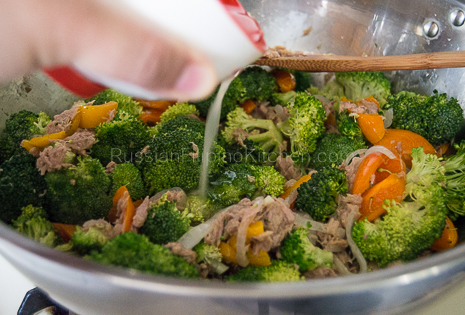 I have a daughter who is a picky eater due to sensory issues but I’m surprised how much she loves broccoli, even plainly cooked like steamed without any seasonings at all. It made me wonder there must be something in this veggie that draws my child to loving it. A quick research on the benefits of eating broccoli gives me tons of information. I encourage you to read this article. It explains very well the benefits of incorporating broccoli in our diet. I’m convinced without doubt that this veggie needs to be a staple in our menu. 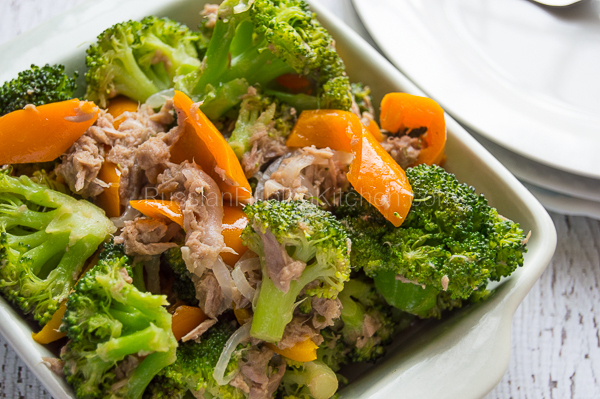 As a mom who desires to become a good model for eating to her kids, I’ve been on the lookout for broccoli recipes that tastes good without compromising nutritional content through over cooking. 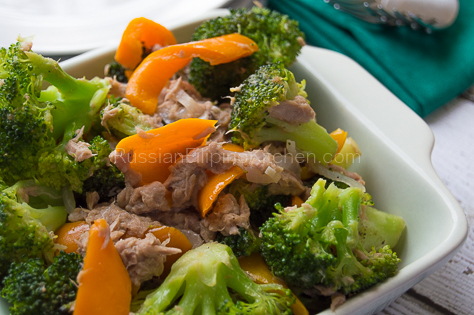 This sauteed broccoli with tuna is one of my favorite ways of cooking broccoli. Though not everybody in my family enjoys fish, the flavor that gets into the veggie makes it appealing enough to my kiddos. And I get to eat fish and vegetable at the same time. It’s perfect balance of protein, carbs, vitamins, and minerals in one serving of this easy but nutrient-laden dish. 1. 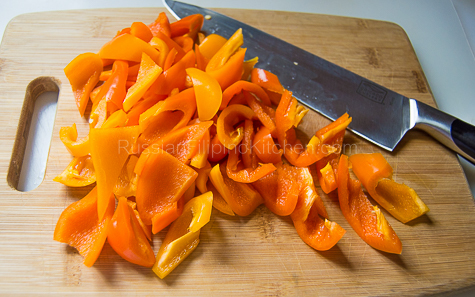 Wash sweet peppers and pat dry with paper towels. Remove core and seeds, and slice into diagonal strips. 2. Peel onion and slice thinly. 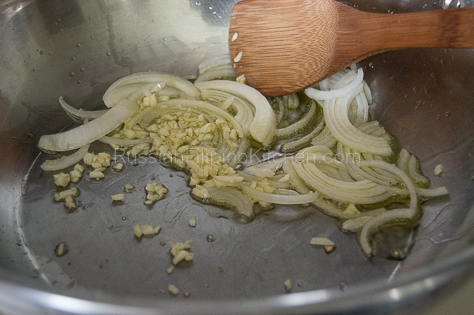 Crush garlic with the flat side of knife to loosen the skin, then peel and mince finely. 3. 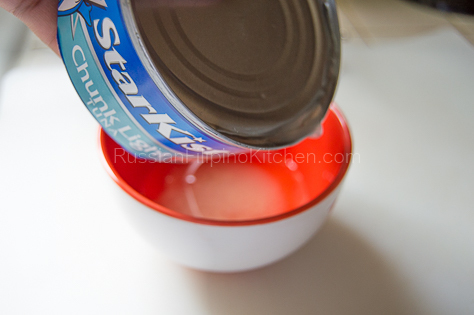 Open can of tuna using a can opener. Drain liquid into a bowl. Set aside until ready to use. 4. Heat skillet / saute pan over medium high heat. Add oil and throw in onions and garlic. Saute until onions become translucent and garlic has browned a little, about 1-2 minutes. 5. 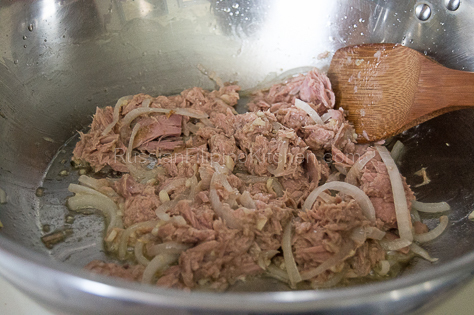 Add drained tuna into the pan and saute for 2 minutes. 6. Throw in sliced peppers and saute for about 3 minutes until slightly limp. 7. 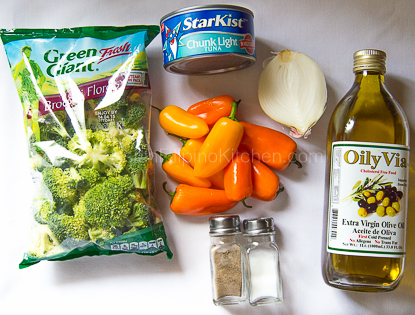 Add the broccoli florets. 8. 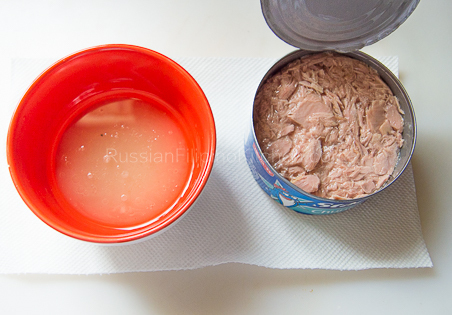 Pour in tuna water and 1 cup of hot water. 9. Season with salt and pepper according to your taste. Personally, I don’t add salt anymore since the canned tuna is salty enough for me. I just add about 1/8 teaspoon of ground black pepper. Mix everything with a cooking spoon. 10. Cover pan and bring to a boil. Simmer for 3-5 minutes according to desired doneness. 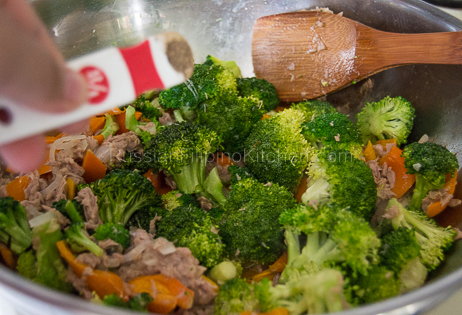 If you like your veggies halfway cooked, simmer for 3 minutes only, otherwise cook for full 5 minutes. Wash sweet peppers and pat dry with paper towels. Remove core and seeds, and slice into diagonal strips. Peel onion and slice thinly. 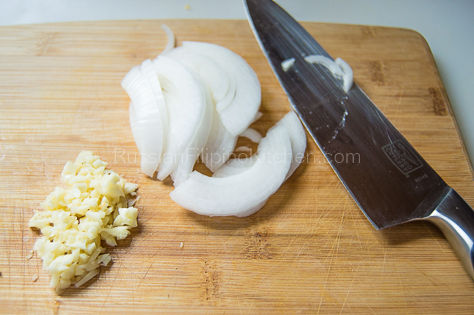 Crush garlic with the flat side of knife to loosen the skin, then peel and mince finely. Open can of tuna using a can opener. Drain liquid into a bowl. Set aside until ready to use. Heat skillet / saute pan over medium high heat. Add oil and throw in onions and garlic. Saute until onions become translucent and garlic has browned a little, about 1-2 minutes. 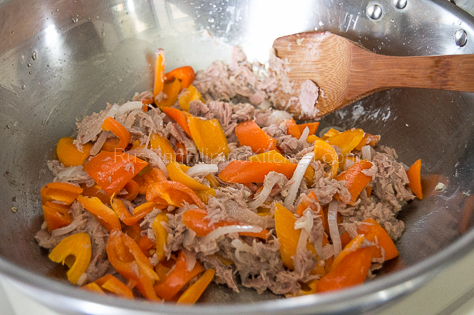 Add drained tuna into the pan and saute for 2 minutes. Throw in sliced peppers and saute for about 3 minutes until slightly limp. Pour in tuna water and 1 cup of hot water. Season with salt and pepper according to your taste. Personally, I don't add salt anymore since the canned tuna is salty enough for me. I just add about ⅛ teaspoon of ground black pepper. Mix everything with a cooking spoon. 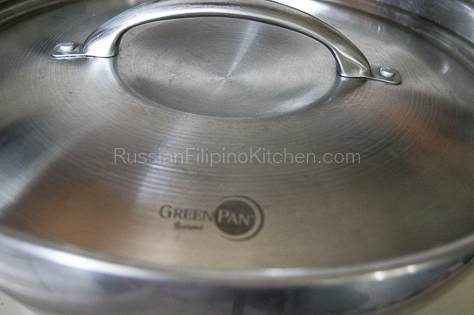 Cover pan and bring to a boil. Simmer for 3-5 minutes according to desired doneness. 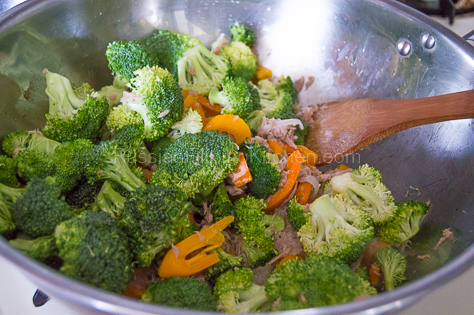 If you like your veggies halfway cooked, simmer for 3 minutes only, otherwise cook for full 5 minutes.